If you have a WordPress site, you know how much a web hosting company can make or break you. Sure, there are dozens of hosting companies out there – some of them promise full service hosting at a cheap price. But, like with most things in life, “you get what you pay for” is true for WordPress hosting. One of the premium WordPress hosting companies is WP Engine. 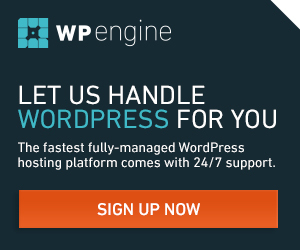 WP Engine specializes in WordPress installs only – if you’re using another platform or your own design, then WP Engine isn’t for you. The upside of this is that the people behind WP Engine know what they’re talking about when it comes to WordPress – and they can offer a suite of solutions to make your site faster and more robust, while making your life as a WordPress admin easier. An easy to use Dashboard. No more poking around an incomprehensible CPanel to find what you need. The WP Engine Dashboard is clean and simple and gives you access to everything you need all at the tip of your fingertips. Staging environment. We’ve all been there – when you add or upgrade a plugin or WordPress core, and it breaks your site. It’s a pain. WP Engine provides a staging environment with every install. You can test changes to the site before making them live – and it’s easy to revert when needed. Easy migration. When you do decide to move your site to WP Engine (and, if you’re serious about your WordPress site, you will), you can rest assured that it will be a painless process with the free migration plugin. Safety, Security, Speed. WP Engine uses their own aggressive caching system which keeps your site running smooth and fast. Additionally, WP Engine does daily backups of your data, and they have anti-virus and anti-malware systems running 24/7. WP Engine also offers a free page speed test – check your speed out now! Whether you are a new or experienced WordPress user, you should consider moving to WP Engine for the best possible WordPress experience.